Welcome to Rohtlätte Holiday Home! Rohtlätte Holiday Home is located on the bank of the quick-flowing creek. In summer the place is covered with green and flowers and in winter there is a lot of snow. 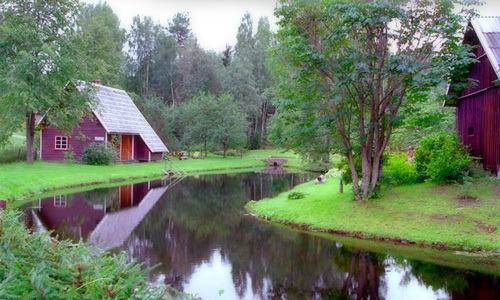 You will find here peaceful farm feeling, clear nature, hiking trails, playgrounds, understanding people and soft bed. Come and see it yourself. Rohtlätte farm was established in 1869. The trees that are growing here have a lot of memories. The people that live here have a lot to care about. In 1994 the seniors of our family were retired and as active people they decided to find some job: so the tourism business was started in our farm. This was a logical step as the farm was in a great state with a good location and surrounded by beautiful nature. As years pass by, our lawns become larger and ponds deeper and larger. The sauna was rebuilt into summer house and picnic house, sheltered grill, swing, playgrounds and sandpit took place on the rangeland. From animal we have dogs, cat, chicken and bees. In summer juniors of our family lives also in the countryside and then 3 generations of us takes care of our visitors. We have many great ideas for the future. Rohtlätte Holiday Home is situated in naturally beautiful surroundings. Everybody is most welcome: nature lovers, anyone of cultured interest as well as the ones interested in spending their holidays actively. 2 double rooms in the residential building. From July to October it is possible to use organic fruits and vegetables for cooking.